King County Search Dog teams are deployed by County Sheriffs or State Emergency Management to help locate missing persons and evidence. 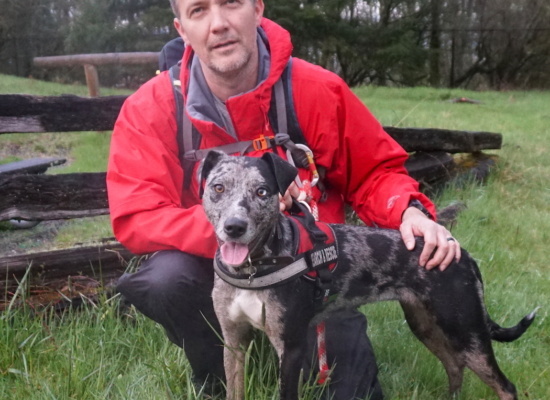 KCSD volunteers and their dogs are certified in two main types of search activity; airscent (looking for any human in a wilderness or park environment) and trailing (looking for a specific human by following a search subject’s unique smells). Some KCSD teams have additional specialty search & rescue certifications for avalanche, disaster, water and human remains detection work. You can learn more in the WHAT we do pages. 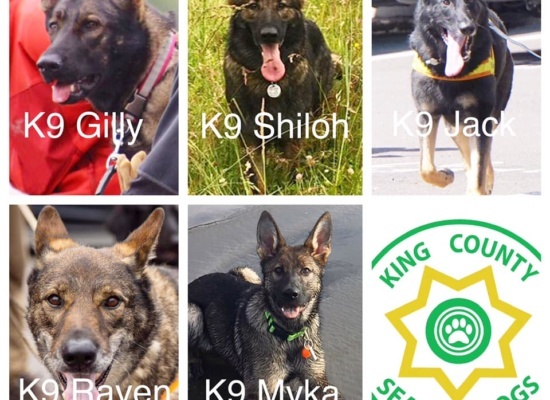 King County Search Dogs train a lot! It takes eighteen months or more of training several times a week to develop a reliable airscent or trailing dog. Continued training is then required to pass periodic re-certification tests. In order to comply with the demanding core competency standards of the King County Search and Rescue Association, KCSD handlers and support personnel also undergo extensive training and testing in areas such as wilderness navigation, search & rescue techniques, radio communication, crime scene management, helicopter safety and searcher survival. Many KCSD members are respected search dog experts who in turn teach throughout the northwest and around the world. KCSD also has an active outreach program to raise awareness of KCSD and to promote personal safety in the wilderness. KCSD members and their dogs visit schools, camps and other groups around King County to provide informative talks and demonstrations. You can find additional information on the Stay Safe and Education Pages. 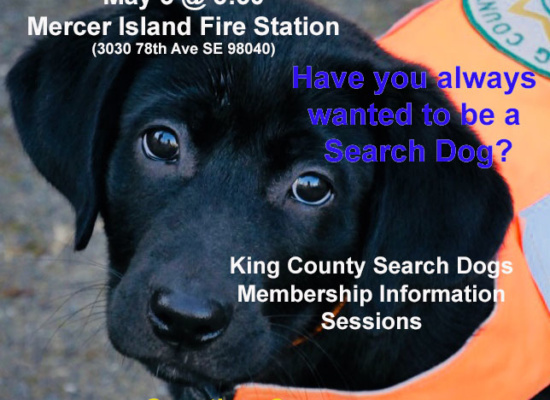 KCSD Members are all volunteers from the Seattle metropolitan area (King, Pierce and Snohomish Counties) who give up hundreds of hours each year training their personal dogs to the professional calibre required for effective search missions. KCSD volunteers are available for missions 24 hours a day, seven days a week and come from all walks of life. Some members have been engaged in search and rescue work for over twenty years! You can learn more about the history and governance of KCSD, browse photo and video albums, and find information on current and past KCSD teams and support personnel in the WHO we are pages. KCSD dogs love to search! Nevertheless, we would much rather meet you at one of our outreach events than as the subject of a Sheriff’s search mission. Before you go out to enjoy the wonderful pacific northwest learn what common sense preparations you can make to keep your activities fun and safe. KCSD is a non-profit, all-volunteer organization and depends on help from the community it serves. You can help KCSD continue its important work through cash or in-kind donations to help the ongoing need for expensive specialized equipment and maintenance. Learn more on the YOU can help pages.